In one of my favorite scenes in The Fairest Portion of the Globe, young ensign Meriwether Lewis plays a game of fives with the treacherous general James Wilkinson. Wilkinson stepped forward and took the ball. “Give it here, Lewis. I don’t want you to mistake my meaning.” With visible fury, he turned and sent the ball slamming into the wall. Startled, Lewis lunged for the ball but collided with Wilkinson’s flying elbow instead. He tripped and crashed onto his hands and knees, face-first into the wall. His head rang and he tasted grit and blood. 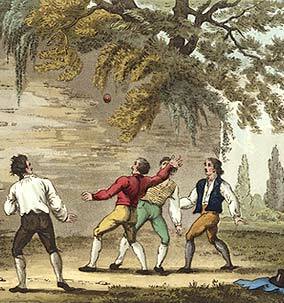 Fives was a ball game that was popular in the 18th and 19th centuries in Britain, Canada, and the United States. Similar to handball, it was formally played on a stone or brick court, and informally against a stone wall in a churchyard. The purpose of the game is to hit a small, hard leather or rubber ball over a line on the back wall so that your opponents cannot return it before the second bounce. The game is fast-paced and requires sharp hand-eye coordination, quick reflexes, and agility. General Thomas Sumter, the "Carolina Gamecock"
Fives was a favorite pastime of country gentlemen in the late 18th and early 19th century. American Revolutionary War General Thomas Sumter of South Carolina, known as “The Carolina Gamecock,” was known for his abilities on the fives court. The most famous fives player who ever lived is said to be John Cavanagh, an Irish house-painter who played on the fives court in St Martin’s Street in London, remaining undefeated until his death in 1819. The popularity of fives waned in the United States in the 19th century, but the game became even more popular in Britain as it was institutionalized as a sport in Britain’s elite public schools. The most well-known variety of fives is Eton Fives, which originated at Eton College in England. 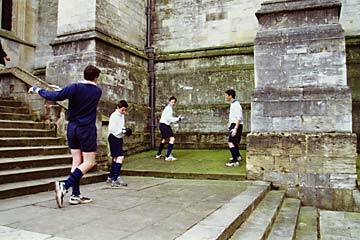 The side of Eton’s chapel is supported by buttresses that form perfect three-sided fives courts in which the students can play. The bay at the foot of the chapel steps is different from the rest, because the steps’ handrail forms a hazard that complicates the game, and a landing between the two flights of steps extends the playing area. Another popular variety of fives, played on a four-sided court, originated at Rugby School in Warwickshire. Though not the craze it once was, Eton Fives and Rugby Fives are still enjoyed by schoolboys and “old boys” in England. Modern Eton Fives is played on courts built to resemble the unique bay at the foot of the Eton chapel steps, recreating the handrail hazard that has long been the bane of many a young scholar-athlete. In the United States, the only known fives courts that are still in use are in Massachusetts: at Groton School, St.Mark’s School, the Union Boat Club, and the A.D. Final Club at Harvard University. on April 7, 2010 at 1:10 pm Allen K.
it goes on for pages after that! Wow! That’s an awesome obit. I happen to agree with it too … who is to say that Cavanaugh didn’t contribute more to the world with his fives playing than many of the men taking their turn upon the public stage.